Try this one on for size: within a mere 100 miles of San Francisco, farmers and ranchers pump out over 20 million tons of food every year―enough produce, meat, dairy, nuts, and grains to feed every Bay Area resident more than three times over. Ironically, a great deal of that food gets shipped elsewhere (40 percent of California’s crops are exported out of state), while a big portion of what we eat here comes straight off the same trucks, boats and airplanes that ship our own local food away. This conundrum forms the core of Think Globally, Eat Locally: A San Francisco Foodshed Assessment, a recent collaboration between Sustainable Agriculture Education (SAGE) and the American Farmland Trust (AFT). The study asks Bay Area eaters to begin seeing the area’s agricultural region as a “foodshed,” a geographically-defined production area much like a watershed. It also acknowledges our place among the top food-producing counties in the nation, and suggests that―which a few system-wide changes―the area can become a model for localizing food distribution in communities nationwide. According to American Farmland Trust’s Ed Thompson, the study is also meant to “acquaint San Franciscans with the incredible cornucopia that surrounds them in order to better protect it from urban sprawl.” He says our foodshed is being developed at a rate of around one acre for every nine new residents in the area – and often right on top of what is very fertile cropland. 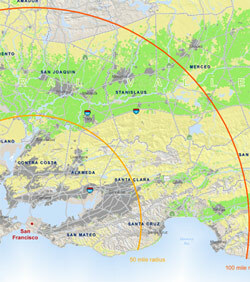 Thompson points to the San Jose/Silicon Valley area as an example. “It was known as the Valley of Heart’s Delight and was filled with the most productive, irreplaceable fruit orchards,” Thompson recalls. “Now it’s all sprawl.” If we begin to develop the land more efficiently, using less space for commercial and infrastructure purposes (surface parking lots, for instance) we’d preserve half a million acres of cropland by 2030. The tie between food and the land is a crucial one, but farmland also has other important values, adds Kraus. “In addition to local food, the agricultural lands around metropolitan areas help protect the air and water, and provide wildlife habitat and flood protection. But most particularly, they contain a city – because cities that are contained are both more efficient economically and more livable socially than cities that sprawl.